acheter Against the Odds annual 2007 - Look Away ! 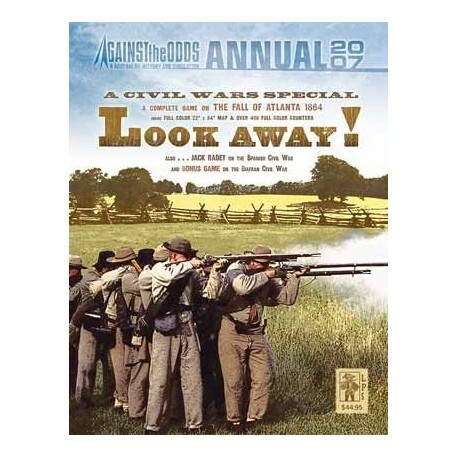 > Livres, revues et accessoires>Revues Wargames>Against the Odds annual 2007 - Look Away ! Against the Odds annual 2007 - Look Away ! En savoir plus sur Against the Odds annual 2007 - Look Away ! The theater of these operations is roughly bounded by the Tennessee River to the north, the Chattanooga area to the west, Atlanta to the south, and the Appalachian Mountains to the east. It was here where the formidable Union command team of Sherman and Thomas plied their trade, dooming the Confederacy's last chance to survive the Yankee onslaught. Here too the soldiers of the rebel Army of Tennessee fought stubbornly to defend their homes.